Could operations whiz Tim Cook run the company someday? Tim Cook (left) and Steve Jobs at Apple headquarters in 2007. Jobs hired Cook from Compaq in 1998 to fix Apple's production mess. Chief Operating Officer Tim Cook isn't the only star obscured by Steve Jobs' celebrity. 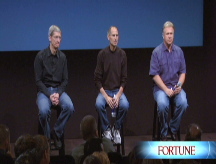 Here's a sampling of the executive talent at Apple's core. Jobs is a hero to many - but there are still nagging questions about his health. (Fortune Magazine) -- The man at the helm of Apple for the next six months while CEO Steve Jobs is on leave is an exacting executive who shares his boss' perfectionism and obsession with detail. Tim Cook, Apple's chief operating officer, has run Apple before: four years ago when Jobs underwent surgery for pancreatic cancer. Only this time, the 48-year-old Cook's stint running the company may end up being the ultimate job tryout. If Jobs' health does not improve, Cook certainly seems a leading candidate to run the Cupertino, Calif.-based computer and device maker. But as Adam Lashinsky reports in a recent Fortune cover story, Cook doesn't see himself as Jobs' replacement. "Come on, replace Steve? No. He's irreplaceable," Cook said recently, according to a person who knows him well. "That's something people have to get over. I see Steve there with gray hair in his 70s, long after I'm retired." "By default Tim Cook would be the logical guy," counters Toni Sacconaghi, an influential Apple analyst at brokerage firm Sanford C. Bernstein. "Yet that hasn't been spelled out. And the stakes are just higher at Apple, because Steve is larger than life, and Tim isn't a known quantity." So the "logical" heir to the throne of one of the coolest - never mind most successful - companies on the planet right now is a blank slate. That is reason enough to find out who the man is. In interviews with two dozen people who have dealt directly with Cook, a picture emerges that is reassuring if unanticipated. It turns out that although Cook and Jobs are in many ways opposites, the No. 2 exec is equally obsessive and exacting about his work. An intensely private Alabaman and Auburn University engineering grad (class of 1982), Cook is also a workaholic whose only interests outside of Apple appear to be cycling, the outdoors, and Auburn football. (Talk about tough years: Apple's stock is down 50% year to date; the Tigers, nationally ranked early in the season, were 4-5 at presstime.) What's more, there's every reason to believe that Apple would at least be stable for some years to come if Cook were to find himself at the helm. The reason: He's essentially been running much of the company for years. Tim Cook arrived at Apple (AAPL, Fortune 500) in 1998 from Compaq Computer. He was a 16-year computer-industry veteran - he'd worked for IBM (IBM, Fortune 500) for 12 of those years - with a mandate to clean up the atrocious state of Apple's manufacturing, distribution, and supply apparatus. One day back then, he convened a meeting with his team, and the discussion turned to a particular problem in Asia. "This is really bad," Cook told the group. "Someone should be in China driving this." Thirty minutes into that meeting Cook looked at Sabih Khan, a key operations executive, and abruptly asked, without a trace of emotion, "Why are you still here?" Khan, who remains one of Cook's top lieutenants to this day, immediately stood up, drove to San Francisco International Airport, and, without a change of clothes, booked a flight to China with no return date, according to people familiar with the episode. The story is vintage Cook: demanding and unemotional. Almost from the time he showed up at Apple, Cook knew he had to pull the company out of manufacturing. He closed factories and warehouses around the world and instead established relationships with contract manufacturers. As a result, Apple's inventory, measured by the amount of time it sat on the company's balance sheet, quickly fell from months to days. Inventory, Cook has said, is "fundamentally evil," and he has been known to observe that it declines in value by 1% to 2% a week in normal times, faster in tough times like the present. "You kind of want to manage it like you're in the dairy business," he has said. "If it gets past its freshness date, you have a problem." This logistical discipline has given Apple inventory management comparable with Dell's, then as now the gold standard for computer-manufacturing efficiency. Apple, thanks to Cook, routinely pulls off the miraculous: unveiling revolutionary products that have been kept completely secret until they magically appear in stores all over the world. The iPhone, the iPod, any number of iMacs and MacBooks - the consistently seamless orchestration of Apple's product introductions and delivery is nothing short of remarkable. A classic example: In 2006 Apple transitioned its entire computer line to running on processors made by Intel (INTC, Fortune 500). For lots of technical reasons we won't go into here, doing that was not easy. But Cook's team somehow made sure there was nary a blip in sales. Think of Cook's contribution like this. There are two basic ways to get great profit margins: Charge high prices or reduce costs. Apple does both. The marketing and design drive consumers wild with desire and make them willing to pay a premium; Cook's operational savvy keeps costs under control. Thus Apple is a cash-generating machine. Cook has called the company a place that is "entrepreneurial in its nature but with the mother of all balance sheets." At last count that meant $24.5 billion in cash and no debt. That balance sheet is a potent strategic weapon: It allows Cook to lock in suppliers and club competitors. In 2005, Apple introduced a new iPod, the Nano, a music player that was revolutionary because it used far more flash memory than existing products on the market. Cook's team accurately predicted tremendous demand for the Nano, and prepaid $1.25 billion to suppliers like Samsung and Hynix to effectively corner the market through 2010 on a specific kind of memory. "That's the sort of thing they wouldn't have thought of in the days before Tim Cook," says Kevin O'Marah, chief strategist at the Boston consulting firm AMR Research, which specializes in supply-chain analysis.